My country (New Zealand) has the third highest rate of car ownership in the world: 6 cars for every 10 people. The massive rate of car ownership began creeping up in the 1980s when tariffs dropped and cheap, second-hand vehicles started flooding in from nearby Japan. Imports rose from less than 3,000 cars in 1985 to 85,000 in 1990, and by 2004 over 150,000 vehicles were being imported in a single year. However, there’ve been a couple snags over the years. First, early GPS units tried to send Auckland residents to Tokyo; and secondly, the car radios ran out of FM station choices pretty quickly. To tune in to your favorite station, you had to buy a band expander, because the Japanese radio frequency spectrum (76-90 MHz) differs from the international spectrum (88-108 MHz), which the USA, New Zealand, and many other countries use. Obviously, they were wrong. Today, both AM and FM radio stations thrive here in New Zealand, and of course internationally, and even the state broadcasters now transmit on both AM and FM. Despite the rise of internet radio, satellite radio, and streaming, radio is still hugely prominent in getting music to the masses. But what actually is the difference between AM and FM radio? Both are methods of encoding and broadcasting radio signals. The difference is how they do that. Radio signals travel as electromagnetic waves — invisible to us, but as fast as the speed of light, and on the spectrum of electromagnetic radiation. Now, this is where it starts to get a little confusing. And it’s got to do with the words we use. Radio waves are around us all the time, but we can’t detect them on our own. They are a long-wave form of electromagnetic radiation. So, more confusingly, radio waves are part of the same spectrum as light, not sound! That’s why they travel as fast as light. Radio waves can’t be “heard” and have nothing to do with sound waves. Sound waves are mechanical vibrations of air particles (which is why sound travels so much slower than light, at a speed of 767 mph), but radio waves are electromagnetic energy and a part of the same spectrum as light. So they travel at about 670,080,887 mph. Like, real fast. Mechanical waves require a medium to pass through, and there are basically two types: Longitudinal waves are sound waves and they move through air, water, and even solid surfaces, but they need to be able to move the particles of that medium; and transverse waves move through water and other media in perpendicular oscillations. 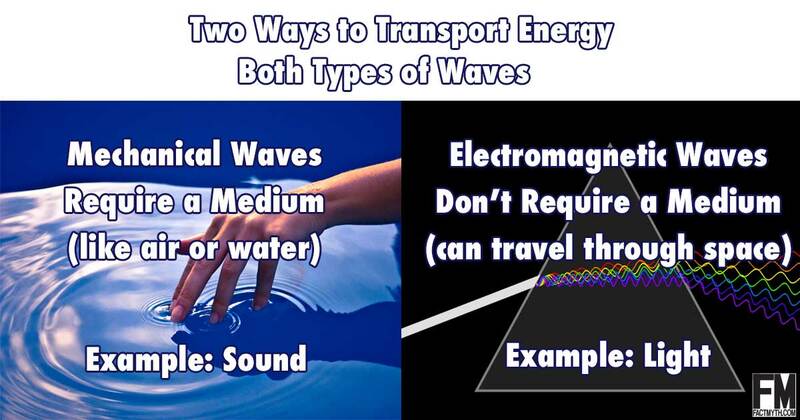 On the other hand, electromagnetic waves — the types of which include light, microwaves, infrared, x-rays, ultraviolet, and radio — do not require a medium through which to travel. That’s why they can move through deep space and through physical barriers. Radio waves surround us all the time, but the only way we can pick them up is with a radio receiver. The term radio also refers to the technology that allows information to be transmitted and received over radio waves. You can have individual pairs of transmitters and receivers that come together, like two-way radios or walkie-talkies, or one-way broadcasts from a single powerful transmitter to multiple receivers, which is like the giant radio towers in your city and the tiny radio in your living room. 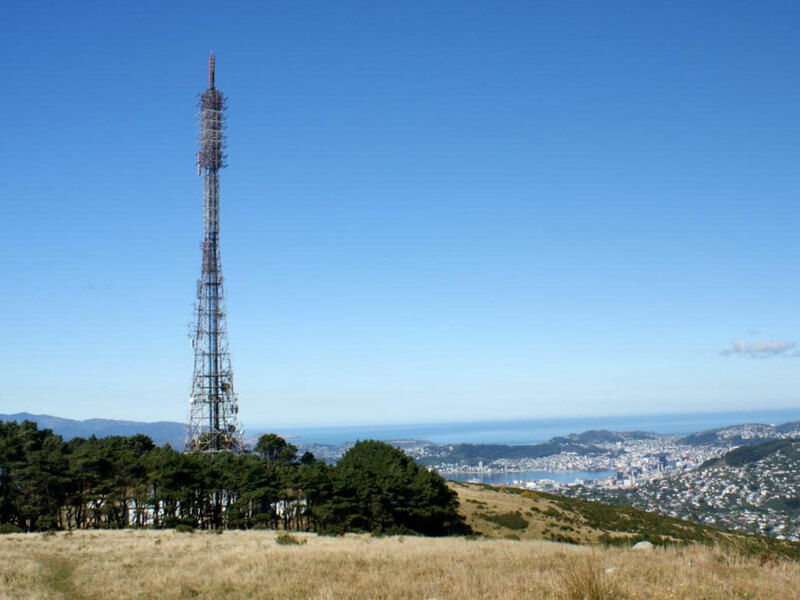 My favorite transmitter, at Mt Kaukau, Wellington, NZ. So if you’re listening to your favorite radio show (like I am right now while writing this), that radio program began as a bunch of sound waves, and was then captured by microphones and turned into electrical signal. It’s then either broadcast immediately from the studio or stored as a recording to use later, but here’s where the AM/FM thing happens. 2. By affecting the frequency or how fast the carrier wave travels (FM: F for frequency, M for modulation). From the antenna on top of the radio station, the highest point in the air it can reach, the signal is then broadcast as electromagnetic waves. The receiver on your personal radio then picks up the waves, amplifies them, and converts them back into sound through the speaker. If there’s no signal attached, you’ll hear nothing, because the carrier waves haven’t been modulated. Although radio waves coming from many stations surround us constantly, your radio doesn’t receive them all at the same time, because stations broadcast at different specific frequencies. You have to tune in to a specific frequency to find the right signal. The numbers on your radio dial represent frequencies used by your local radio stations. If the FM dial is set at 89, the radio signal you hear is broadcasted at 89 MegaHertz (MHz), or 89,000,000 cycles per second. The difference in the way AM and FM radio signals are encoded means differences in sound quality, performance, and broadcast range between the two types of station. This explains why FM stations sound better than AM stations, but AM stations can be heard from further away. AM radio varies the amplitude of the broadcast signal so the power at which that signal is broadcast is also changed, since amplitude represents the strength of the signal. Some receivers can’t pick up low amplitude signals at all. FM radio, always remains at constant amplitude, so signal strength does not change. FM uses a higher frequency range and a bigger bandwidth than AM. AM radio operates from 535 kHz (kiloHertz) to 1605 kHz. When you tune the dial on your radio, the number changes by 10 kHz each time. This means that each station has 10 kHz of bandwidth on which to broadcast. FM radio on the other hand operates between 88 MHz (MegaHz) and 108 MHz, and your radio increments every 200 kHz. Each FM station is allocated 150 kHz of bandwidth, which is 15 times that of an AM station. This means that an FM station can transmit 15 times as much information as an AM station and explains why music sounds so much better on FM. Since music has more electrical information contained within it than a monophonic voice audio signal, FM typically broadcasts music and AM generally sticks to talking programs. The trade off for AM radio, though, is that the lower frequency band means that it has a larger wavelength and therefore a much longer broadcast range. If you think about important information that has to be broadcast out to a wide range of citizens, like traffic or weather warnings, or government announcements, AM is still the way to go. (Although if the information is urgent enough, it will likely be transmitted in as many places as possible.) That’s the reason Radio New Zealand National (AM) is our designated Civil Defense lifeline utility radio broadcaster. In addition, the larger wavelength waves of AM also travel very well through solid objects, like mountains! Higher frequency FM radio waves don’t do so well here. Lastly, despite AM radio’s potential for increased interference from natural radio waves, particularly solar, it is actually theoretically possible for an AM broadcast to be heard right around the world.